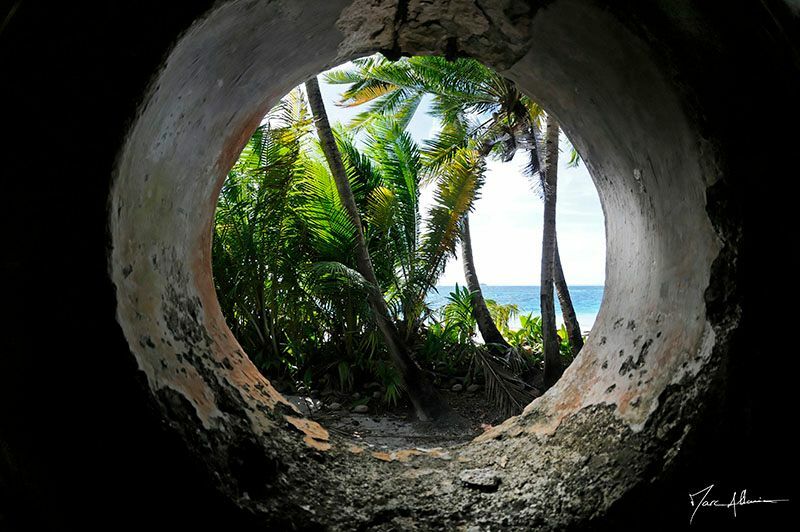 Diego Garcia, an atoll occupied by a representation of the US Army, being a prohibited area to more than 12 nautical miles around, only travelers arriving by sailing today have access to two atolls of the archipelago: Solomon and Peros Banhos. On these two atolls forty years ago, Mauritian and Seychellois communities were living, exploiting the copra. Of these years spent on these atolls, there remain today only some vestiges overtaken by Nature. Because in the tropics the rain forest is recovering its rights at a surprising speed. As soon as the roof collapses and the light returned to the house, wildlife will resume its rights. It will be herbs, lianas, whole trees that will forge a passage through the concrete slabs, thus covering almost all dwellings. 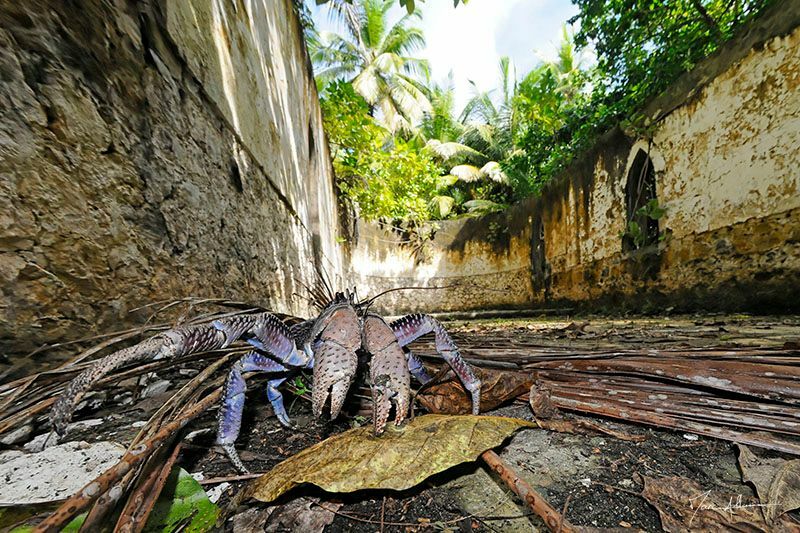 On Boddam island, part of Solomon atoll, the former four-cell prison is now littered with lianas and guarded by some coconut crabs, a protected species on the archipelago. The church has lost its roof and has kept only one of its stained glass windows, ready to fall. Only the old school has kept its roof and therefore a floor still virgin of vegetation. Elsewhere, the ruins seem to be several centuries old with the exception of the seaside maintained or, say, rather arranged by the sailboat travelers to decorate some improvised barbecue. 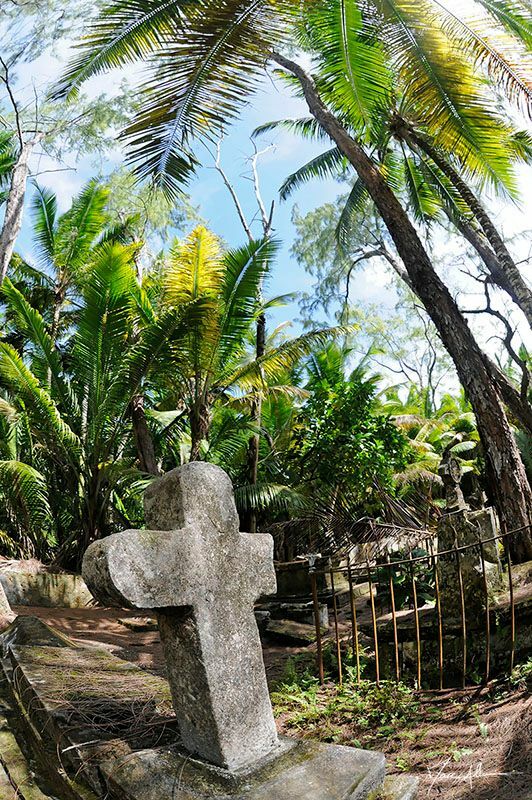 A stele dated 2006 testifies to the regular passage of some Chagossians who came to pay a regular tribute to their old Land. The good state of the cemetery is also a testimony of their regular arrival. These are really wonderful shots. Of lost places, unfortunately, I have no recordings. So far I have limited myself to landscape photography and macro photography. Unfortunately, most obejktive costs so much that you have to decide between travel destination and an lense. Thank you. You can find more story about Chagos on my blog in french by me, or in english by @vcelier. Hello @vcelier! This is a friendly reminder that a Partiko user has just followed you! Congratulations! Congratulations @vcelier! You received a personal award!